The fourth day of the Mahotsav commenced with a swagat parade into the sabha mandap led by Swamibapa Pipe Band. The parade also featured the elephant His Divine Holiness Acharya Swamishree would sit and give darshan upon during the India Day Parade in the afternoon. Once inside the sabha mandap, eminent sants commenced the scripture recitals. Then, disciples performed aarti to Acharya Swamishree. After the aarti, Acharya Swamishree gave His divine ashirwad to everyone who had gathered. The fourth day of the Shree Muktajeevan Swamibapa Shatabdi, USA fell on Sadguru Din. In His divine blessings, Acharya Swamishree explained the importance of the day. Sadguru Din is amongst the favorite days of Shree Muktajeevan Swamibapa. It commemorates the life and works of Sadguru Shree Ishwarbapa, who was truly beloved to Muktajeevan Swamibapa. Sadguru Din is the day where we all, sants and devotees, have to measure how far we have reached in the religion since the previous Sadguru Din. Three things should constantly run through our minds as we are measuring. First, we should truly understand the form and knowledge of the Lord. Second, always put the Lord before daily worldly affairs. If one does so, then the Lord always fulfills his deeds promptly and easily. Last but not least, one’s thoughts should be towards God and not worldly pleasures (maya). If one wants to stay within Lord’s murti, his thoughts should be pure. Words from our mouth bring both peace and obstruction. We should always think before speaking and speak in a low tone. What we preach, we must also follow. Lord loves us all, so we must ensure that we act according to His will. Whatever we as disciples do to please the Lord (i.e. devotional dances, kirtan-bhakti, reciting holy scriptures etc.) should be kept in our memories. Those memories are a step in the ladder towards Akshardham. The Lord gave us the opportunity to please Him, and we should never forget these memories. Lord Shree Swaminarayan is ever-present at Shree Swaminarayan Gadi, and He is the cause. 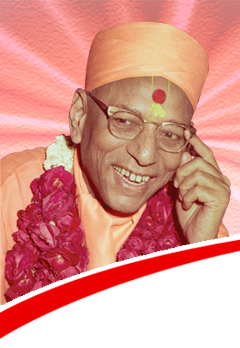 He is omniscient and works through the Acharya of Shree Swaminarayan Gadi. He is the supporter of all of us and is the power behind closed doors. Whoever understands this will have their lives filled with happiness and love. Acharya Swamishree’s ashirwad ended the morning program. After maha-prasad, everyone headed to Jersey City for the India Day Parade. Jersey City is the most diverse city in all of New Jersey, making it the ideal location for the India Day Parade. It was perfect for sharing the Indian culture and our Swaminarayan religion. During the parade, His Divine Holiness Acharya Swamishree bestowed His divine darshan while being seated on an elephant. This was truly a sight for both disciples and Jersey City community members. It was a spectacle that will be remembered forever. Swamibapa Pipe Band led the grand parade throughout the streets of the city. Young girls also performed raas and garba to add grandeur to the parade. Hundreds of disciples had gathered to join Acharya Swamishree in the parade, and the crowds that watched the parade exceeded thousands. After the India Day Parade, sants and disciples presented a cultural program organized by the temple. The program consisted of Acharya Swamishree’s ashirwad, speeches by the India Day Parade committee members, and devotional and patriotic dances performed by sants and disciples. All who had gathered, including disciples and community members, enjoyed the delightful program.